in charge of my third officer. I never saw a wreck and have never wrecked, nor was I ever in any predicament that threatened to end in disaster of any sort. You see, I am not very good material for a story. Captain Smith, New York, May 16, 1907. Edward John Smith was born at Hanley, Staffordshire, England on January 27, 1850. He died April 15, 1912 in the vicinity of 41 degrees 43minutes 32" N, 49 degrees 56 minutes 49'W. He spent 43 of his 62 years at sea, 26 of them with a single company- the White Star Line. When Edward was born, the Smith family lived in Well Street, Hanley. As a child he attended the Etruria County Primary School. In 1869, at age 19, Edward J. Smith signed on as apprentice with the sailing firm of A. Gibson & Co., Liverpool. Young Smiths first service was aboard the companys American-built clipper ship Senator Weber. In 1875, at Liverpool, Smith sat for and passed his Masters Certificate (#14102) and the following year saw him aboard the sailing vessel Lizzie Fennell as fourth officer. He joined White Star Line in 1886. His first assignment was fourth officer aboard the liner Celtic (1872). After a year which included service aboard the Adriatic (1871), Smith was given his first White Star command, returning to the Celtic as her captain. Except for periodic minor diversions, presumably for experience, his rise in the companys roster of commanders was rapid and sure. Edward Smith was married to Sarah Eleanor (she preferred to be addressed as Eleanor). They had only one child, Helen Melville (called Babs or Mel) who was born in 1898. Eleanors intimate and affectionate name for her husband was Ted and occasionally Teddy, while he referred to her as my only dear one. Eleanor Smith died in London on April 28, 1931 as the result of an accident. At the time of Edwards death the family lived at Woodhead, Winn Road, Southampton- a red double-fronted house with twin gables. This residence later was named Coulthurstand then became numbered 32 Winn Road. The property was destroyed by aerial bombing during the war in 1939. Captain Smiths home telephone number at Woodhead was Southampton 1400. 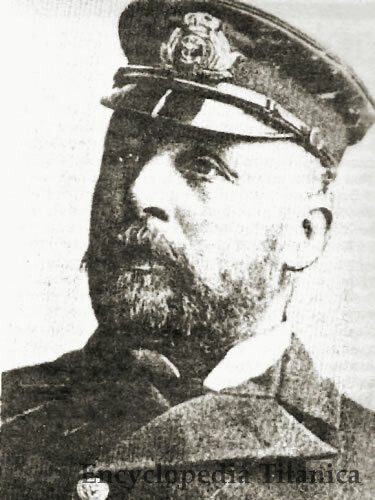 Most of Captain Smiths later photographs show him in full uniform, wearing two medals. The decorations are the Transport Medal- awarded to certain officers of specially-chartered troop transports during the 1899-1902 South African Boer War and the Royal Naval Reserve Decoration- awarded to officers with 15 or more years service with the Royal Navy Reserve..
Captain Smith was an honorary Commander of the Royal Navy Reserve, Retired, and held an official warrant (#690) which permitted him to fly the Blue Ensign from any merchant vessel under his command. Contrary to popular belief, Captain Smith was not on his last trip when he took Titanic out on her maiden voyage. According to a story in the Halifax, Nova Scotia Morning Chronicle, Friday April 19, When Smith was put in command of the Titanic, it was reported that he would retire after he conducted her across the Atlantic and back. But the White Star officials afterwards announced that he would have charge of the Titanic until the Company completed a larger and finer steamer. Another article implied that Capt. Smiths retirement would occur following his taking out this larger and finer steamer on its own maiden voyage. It is not in the scope of this brief biographical sketch to try to trace Captain Smiths activities during the final hours of his last command. Suffice it to say E.J. behaved as might have been expected, in the finest traditions of gentility and British seamanship. It is alleged that he jumped from the ship, picked up a child in the icy sea, and bore it in his arms while swimming on his back to a nearby lifeboat, refusing to climb aboard the boat himself and returning to the sinking ship. This heroic act is related by several witnesses with sufficient variation in detail as to preclude mere parroting. Subsequent American and British investigations implied that Smith was guilty of careless navigation practices. But he paid for whatever folly of which he may have been guilty by dying the requisite heros death. The lives of few liner captains have been recalled by as many memorials as those dedicated to Edward J. Smith. At his Hanley birthplace a plaque on the town hall has been affixed in his memory and another adorns the wall of the Etruria School. At Lichfield, Staffordshire stands the Capt. E.J. Smith memorial, a larger-than-life- sized bronze statue on a pedestal of granite. The statue was sculpted by Lady Scott, widow of the Arctic explorer, and was unveiled by Capt. Smiths daughter on July 29, 1914. He sailed the sea for forty years. Record of Service Edward J. Smith R.D., R.N.R.